Sharp-eyed readers may have noticed a new photo of me on the blog profile and the About page of the WHM that looks less like a self-portrait of a photography enthusiast taken in a mirror. 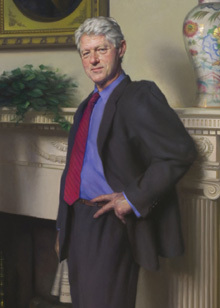 I think it compares favorably with the one of Clinton looking like he had a little Captain in him. Aside to John: I know how you like furniture, so before you ask–Yes, that’s a genuine 2005 Flexsteel “C5365” armchair covered in teal velveteen. Only the finest for Diamond VIP members at the Pittsburgh Doubletree. Recent comments and an e-mail from Dale L about how comfortable first families might be in the big rooms of the second floor got me wondering. Most presidents have lived in mansions before the WH. Who do you think was the last president not to have any full-time household servants before coming to the WH? Truman, maybe? Clinton and Carter weren’t especially rich, but as governors they must have had cooks and housekeepers. There probably have been very few in total…. Lincoln probably being another. Coolidge, maybe? Also: Thanks to Logan P for the scans of the Reagan era Residence from Architectural Digest, Dec 81. I’ll be adding those very soon. The “Polkarama!” post produced a lively exchange about the livability of the White House. I personally think that any house that is over 200 years old pretty much inevitably becomes a museum. I think that most first families come from backgrounds in which they are used to very large houses with formal sitting rooms with uncomfortable furniture and more casual living rooms with more comfortable furniture. Some even split the difference and put their feet up on 150-year-old historic tables. I wonder tho, if the WH is coming to a point where it’s impractical to really live there, especially for a younger couple with small children (never mind a pony). I wouldn’t be surprised if its 250th anniversary (in 2050) marked the moment that it gets turned into a permanent museum, with the president working out the the EEOB and living in a new mansion built on some former parkland or replacing some government building (there’s a Postal Service training facility around DC that gets rented to corporations that would be a pretty good site, I think). I’m not advocating it, just speculating. I do think the WH needs more business-casual rooms. “Map Room”? Bah! Maybe it’s the jet lag talking, but I’d like to see a “Churchill Room” furnished in English club furniture and stinking of cigars and brandy. I changed the front page to a pleasant wintery scene from around 2003. I’ll do a splashy, colorful interior next month. * I might be mistaken about that. ** I could still be mistaken about that. On the comments for the Reagan post, visitor Anonymous noted that one of the West Wing page pics looked a little odd (specifically, the one that says “(note the clothes line on the east side)”), which sparked a reevaluation of the early WW images. John in NOLA noted that the Roosevelt colonial Rose Garden was intact that pic, so it couldn’t be 1920 as I had labeled it and in fact looked to be freshly expanded by Taft in 1909. Visitor Geoffrey M pointed me in the direction of some Reagan-era photos new to the Reagan Library site since I visited there last. I’ve added eight to all different pages. I’ve also enhanced the Oval Office Patio page with a couple of new pics and some from other pages. See What’s New.